Pork and Veggie Potstickers are my favorite Chinese food. The seasonings in the filling are incredible and they come out restaurant-quality every time! I love potstickers but for some reason I was always intimidated to make them until about 3 years ago. I don’t know why I was intimidated… They are SO EASY! I haven’t ordered them from a restaurant since! Seriously, for the price of 8 of these in a restaurant you can make over 100.. PLUS they are FAR better than anything I have had in a restaurant! They are packed full of flavor. Every time I have made these, they get eaten before I can even get them on the table for dinner. Not even kidding! People can’t keep their hands off of these potstickers! For those of you who have never had potstickers before, now is the time to make them and try them! When I first made these my husband had never had a potsticker before. I had to BEG him to try one and he finally caved. Now they are one of his very favorite appetizers. He requests them ALL the time! Sometimes we make these for dinner and serve them over rice or noodles. We always like to dip our potstickers in Yoshida’s sauce but you can dip them in soy sauce, sweet & sour sauce or you can eat them just plain! They are definitely good enough to eat as-is right out of the pan! Combine the first 12 ingredients in a medium-size mixing bowl (pork through cayenne). To form the dumplings, remove 1 wonton wrapper from the package, covering the others with a damp cloth so they won't dry out. Brush 2 of the edges of the wrapper lightly with water. Place 1/2 rounded teaspoons of the pork mixture in the center of the wrapper (Yes, the pork mixture is uncooked. It will cook completely through the thin wrapper, I promise). Fold over, seal edges, and shape as desired. Set on a sheet pan and cover with a damp cloth. Repeat procedure until all of the filling is gone. Heat a 12-inch saute pan over medium heat. Brush with vegetable oil once hot. 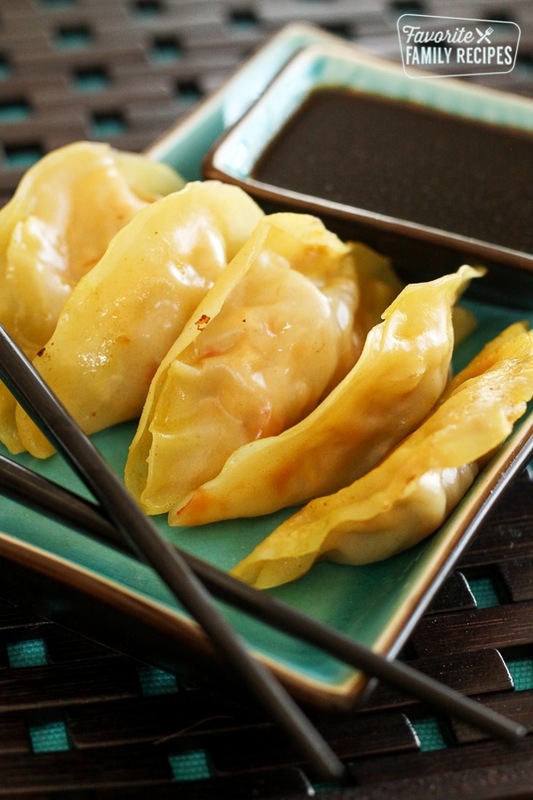 Add 8 to 10 potstickers at a time to the pan and cook for 2 minutes, without touching. Once the 2 minutes are up, gently add 1/3 cup chicken stock to the pan. Turn the heat down to low, cover, and cook for another 2-3 minutes. Remove wontons to a heatproof platter and place in the warm oven. Clean the pan in between batches by pouring in water and allowing the pan to deglaze. Repeat until all the wontons are cooked. Serve immediately with Yoshida's sauce for dipping. Pair this some of our other Asian inspired recipes and you can have a full-on family style Chinese take-out night at home for a fraction of the price of going out. Jared’s Gerenal Tso’s Chicken – Jared’s General Tso’s Chicken is incredibly flavorful. It is a delicious, lightly fried, Chinese style chicken that is crispy, sweet, and slightly spicy. P.F. Chang’s Mongolian Beef – You can make this P.F. Changs Mongolian Beef for the ENTIRE family for the same price (or less) as one order of Mongolian Beef from off of the menu! Orange Chicken – Make your own orange chicken at home with this delicious and flavorful recipe. Crock Pot Cashew Chicken – This Crock Pot Cashew Chicken is better than takeout! Throw it all in the slow cooker and have a delicious, no-fuss dinner. Kung Pao Chicken – Mix your favorite veggies with this delicious chicken seasoned to perfection with just the right amount of kick. I have to apologize for never commenting. Every time you have a new recipe up, I always come by and check it out. Thank you for taking the time to share all of your fabulous recipes. These pot stickers sound delicious! wow, I've never heard of ketchup and mustard in pot stickers before. Interesting. I posted the pot sticker recipe that I typically use, on my blog recently. I've also tried Anita Lo's recipe, which Bobby Flay featured on one of his Throwndown's. It was fantastic. Found your site when looking for a Cafe Rio Pork recipe (which turned out awesome by the way, thank you), but my husband and I love to cook good, quality food and we are eager to try many of your recipes. Thanks for posting such great ones! Carol- Thanks for your comment and for being such a loyal follower! Keep checking back, there are many more to come, I promise! Lisa- I thought the ketchup would be weird too but they are a total hit! It doesn't taste ketchup-y at all. They have a nice rounded out flavor. I will have to try the Anita Lo's one! Love the tittle of the blog and now i see why…waht fantastic recipes …they'll surely be favs !!!! Oh my heck Erica! You were right! I’m going to give these a try! I don’t know if my other message came through but I got serious and baked that coconut cake today. I can’t believe it survived long enough to make it to the freezer without being eaten. I can’t wait to ice it. It may have to be breakfast tomorrow. Haha! I can’t stop thinking about it! Oh I will be more specific, I knew this recipe came from Food Network (to which I gave credit at the bottom of the post) but I will add that it was from Alton Brown. Wow! I know this is the second time that I have raised an issue with your recipe, but this one, with all due respect, needs a rework. Cabbage will never become tender in the brief frying period called for. One must use Nappa Cabbage (Chinese) available at any large grocery store, or some form of lettuce. The frying part is on target, except that when you have given the bottom side of the dumpling nice brown coloring, two to three minutes normally in a hot pan, then you add chicken stock or water, AND flip them over, so that the top part of the wonton wrapper becomes cooked as well. As regards the filling, I have never heard of anyone adding ketchup to a Asian dumpling, and I doubt that Alton Brown has suggested same. However, I will check, and perhaps have to eat crow tomorrow. LOL. Wow, thank you for your comment. It has been so long since I referred back to the original recipe I don’t know for sure if he adds ketchup. It is amazing though! I have always used the cabbage in it and it always becomes tender. I always shred it really thin. I like using the cabbage because it makes the meat go further. Give it a try and let me know what you think! I’d like to take these to a picnic we are going to. But I know that they won’t be warm when served, do you think that would be a problem? I still plan on making these for myself, but thought they sounded good enough to take to a picnic. I have eaten them cold and they are just ok. Definitely best to serve them hot! Thanks for the quick response, I will still make these, but not to take to our picnic. Can you freeze these?How cool that would be! Can’t say that I have ever tried freezing… I don’t know if I know enough about freezing to know how to properly do it with this recipe. If you figure out a good way, let me know! We have a small family and so I doubled the recipe and froze the meat in parts. I think they will be great to freeze the meat for future use and my son LOVES these. Thanks! Can you freeze these? How cool that would be! These were so good I had them for breakfast the next morning. Not even kidding. So glad you liked them! They are one of our very favorites too! I seriously can’t make them fast enough– they always get eaten as soon as I take them out of the pan! my family just loved them! I thought they would be hard and time consuming to to make , but they wern’t. Just wondering, would they be ok to be made with hamburger instead of pork? I always have ground beef on hand (never carry pork), so just wondering if it would work. I love Chinese food of all kinds, especially potstickers, Kung pao, Mongolian beef, and anything with noodles. For the potstickers, have you tried them without meat inside? I Love veggies of all kinds, way more than I do meat, so was hoping the recipe would lend itself to just the meatless..any ideas? You could definitely do them meatless, just add extra veggies!